Back in the day when I was a Saturday girl at the local greasy spoon, I had a few quid a week to spend entirely on myself - the days of no rent, bills and food shops were blissful. Something that I would often do is head to a nail salon for some killer talons however, since I became an independent woman, I have to choose a full fridge over false nails. I haven't had acrylic nails on since I was about 18 so it was a lovely surprise to be asked along to the Poize beauty salon in Liverpool to be treated to a full set of acrylics and to have a tour of their salon. 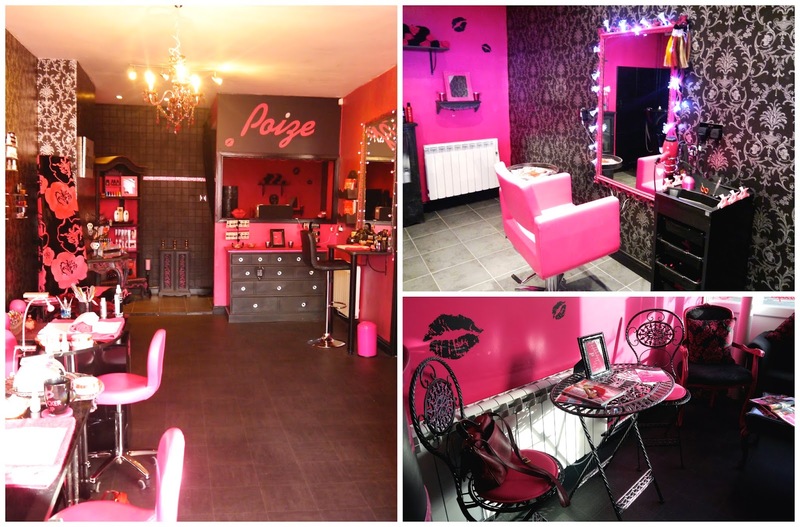 Poize opened in September last year and is located just outside of Liverpool city centre in Tuebrook. I live in the top end of the city and I walked to my appointment which took around 35-40 minutes in total and a taxi would be no more than £5. When I arrived at the salon I was greeted by the lovely beautician Steph who showed me around. The Poize salon interior decor reminds me of my childhood bedroom as it adorned with sparkly chandeliers, ornate mirrors and crystal trinkets. The pink and black colour scheme is super striking and the whole place is warm and welcoming. Steph offered me a drink upon arrival and customers can choose anything from the menu including wine, soft drinks and tea or coffee. Inside there are four different treatment areas including the nail stations, the hair salon, a make-up area and upstairs a private treatment room which I think is used for tanning, massages and other beauty treatments such as waxing and lash extensions. When I sat down I showed Steph my stubby, disgusting bitten nails and she reassured me that there was something that could be done. I was at the nail station for around two hours whilst Steph buffed, filed and applied my new nails. Her care and attention to detail was really good and I must note that she used an emery board to file my nails instead of a metal drill which I have heard can be super unhealthy and dangerous. 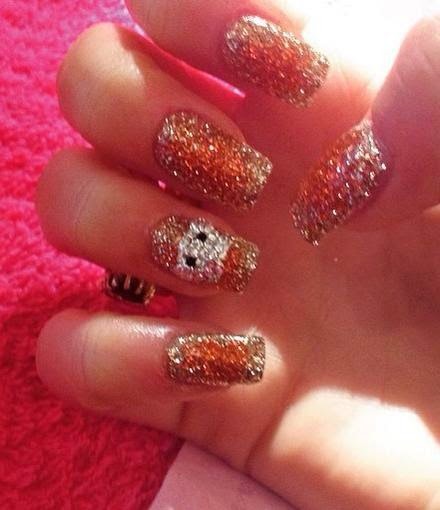 Steph used Gellish polish on me and I opted for a striking orange and gold glitter design with cute Hello Kitty jewels on either ring finger. Whilst I am a student and working in a fairly liberal workplace, I was able to go all out with an opulent design however, I had seen that Steph had created some really elegant, plainer nails for my friend Frances Cassandra. 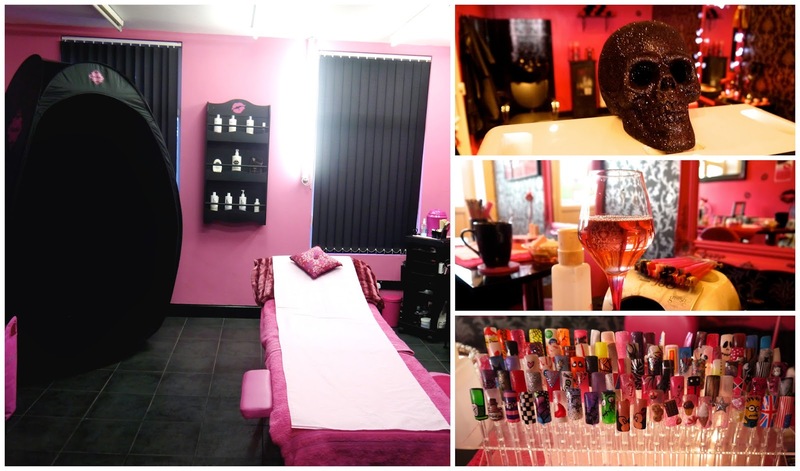 The salon offers a wide range of beauty products including massages, spray tans and hair styling. I am tempted to head back in a few weeks for eyebrow extensions to try and help make my thin brows fuller. 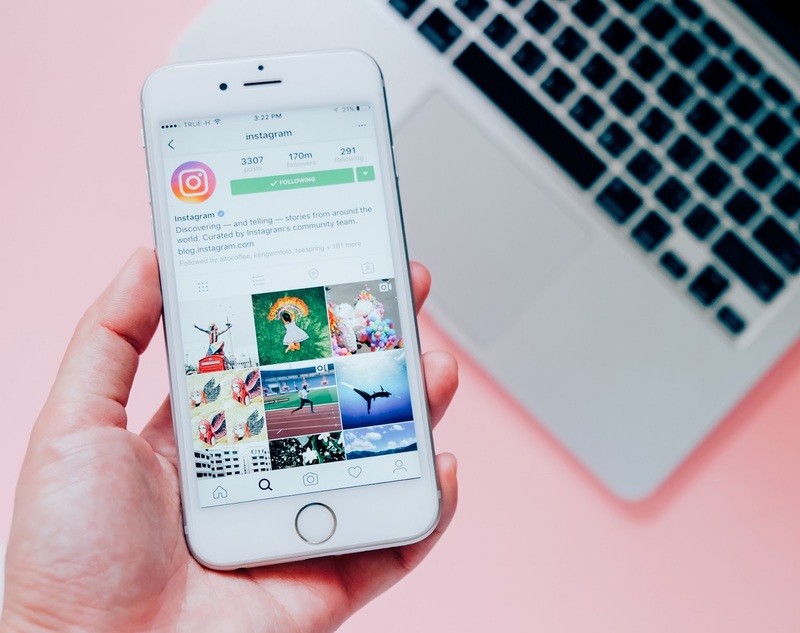 You can find the lovely Poize team on Twitter and they are always on hand to chat if you need any more information about the salon or any of their beauty treatments. If you're in the Liverpool area I recommend that you give them a try and thank-you again to the team for inviting me to try a treatment. Hi, i'm Hollie! I'm equal parts bold lippy wearer & cat lover. Welcome to GGMH, find beauty reviews, mental health musings, general work and digital marketing advice and much more. © 2018 Good Golly Miss Hollie | UK Beauty Fashion Lifestyle Blog | All rights reserved.. Powered by Blogger.